Congratulations Steve for the brilliant website and wonderful collection!! Greetings from a Spanish supporter of Real Oviedo. Oh I follow Hereford as well as the Hammers. This is a really great site especially for those who follow the mighty Hammers. GSB out!!!!! Nice work Steve the badges look great! I'am i supporter of Feyenoord. You have i nice site. Come to www.pinsworld.nl and you can see dutch badges . i'm a fan of the french club AS SAINT ETIENNE and Steven who is a true friend on facebook has a great and wonderful collection ; congratulations ! 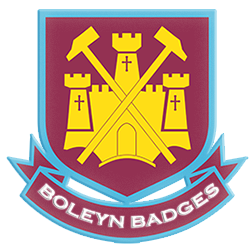 Excellent website Steve, you're a very passionate West Ham fan that loves his badges too! Hello from Aberdeen, wonderful collection!! One of the coolest sites I've seen. Absolutely great collection! Greetings from West Ham and Dinamo Zagreb supporter! An outstanding collection of badges. Thanks for sharing. Great website and tweets! From a Watford supporter in Ireland.